The Egg Review - Effective Personal Cloud Storage Device? Electronics Computers The Egg Review – Effective Personal Cloud Storage Device? The Egg is a new breed of personal storage device. Traditional personal storage devices such as portable hard drives or SSD’s are typically clunky, unsecure and ‘dumb’- they don’t offer any features beyond drag and drop file backup. The Egg changes the personal storage game with their portable, versatile and secure file storage solution. The Egg is a smart storage device, personal web server and portable media streamer all rolled into one, and it fits in your pocket. Born from a wildly successful Kickstarter campaign, The Egg has gathered media attention from a wide range of tech-savvy publications such as Slashgear, PCmag, Lonely Planet and more. The original Egg Kickstarter campaign received an incredible $101,237 USD in funding from hundreds of backers and can now be ordered online and delivered anywhere in the world. In this article we’ll crack open the Eggcyte Egg and take a close look at exactly what it does, how it works, and provide a breakdown of its key features, design and construction to help you decide if The Egg is the best personal storage solution for you. The Egg is the first handheld personal web device that promises to securely store and organise all of the content, from all of your devices, all of the time. In a world where cloud storage services are frequently hacked and even industry juggernauts such as Sony are being compromised on a regular basis, The Egg offers peace of mind with streamlined and simple sharing, storing and securing of personal data outside of ubiquitous cloud storage. The Egg automatically scans devices you’ve connected to it for content, clones the data it finds, and stores it, meaning you’ll never run out of storage space on your phone, camera, or just about any device with onboard storage. 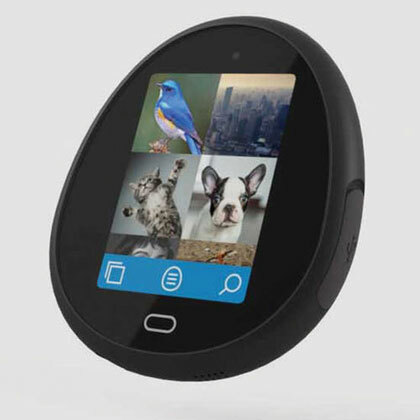 The Egg can instantly share photos or media such as HD movies or music. The Egg can be accessed from anywhere in the world, and even has secondary applications such as the ability to charge the batteries of other devices via a USB charging slot. Cloud services can often come with vague or difficult to understand fine print, especially when it comes to usage rights of the content that is stored on them. Photographers that rely on the usage rights of the content they produce as a source of income or musicians that use cloud storage to store their recordings can often find themselves taken advantage of by exploitative cloud storage terms and conditions that allow cloud hosts to use their content free of charge. The Egg offers total security of personal content by stopping the tracking or scanning of your data by cloud hosts so it remains entirely owned by the creator. The Egg is an excellent personal storage solution for individuals working in data-dense industries such as videographers or photographers in which backing up large amounts of data is pivotal. Often when working in locations where upload speed is slow or nonexistent backing up critical data can be costly, unreliable and time consuming and carrying an unwieldy hard drive or PC to backup content can prove difficult. The Egg provides a solution to all of these issues in a discreet, pocket sized portable storage solution that keeps your files safe and secured from the cloud. The unique handheld design of The Egg holds within it up to 256GB of onboard storage in a carefully designed, compact form factor. The Egg is powered by the Intel Atom platform and is easily configured and managed via a color touch screen. Smarter than your average storage device, The Egg has an intelligent onboard processor that offers secure, high performance options . With a massive sixteen hours active use, The Egg can broadcast data via a wifi access point that makes sharing your data without wires simple and easy. Available in four colours- Charcoal, Chalk, Blue, and Robin, a speckled-egg effect, The Egg comes in three different storage capacities from 64GB to 256GB and contains an 1800mAh battery for long usage life. Compatible with all devices that support either wifi, Bluetooth or USB connection, The Egg can be used to back up data from a vast variety of devices including Android devices, iPhones, GoPro cameras and more. The Egg offers features such as local wifi video streaming, bluetooth music streaming, remote access via a browser, Android or iOS app, can be configured to backup to cloud services if you desire, and can be programmed to automatically pull content from devices. The Egg has 1GB onboard ram and the heavy thinking required to run the search and backup process is powered by an Intel Atom processor. Running a custom Linux Kernel, The Egg offers haptic notifications via a vibra motor and speaker notifications and can record environmental data with an accelerometer, compass and ambient light sensor. The Egg is also incredibly light, weighing in at just 3oz, or 85 grams. Using The Egg is incredibly simple- users need only plug The Egg into the device that the user would like to capture data fràm, such as an iPhone, digital camera, or GoPro and The Egg will do all of the hard work, autonomously searching for and backing up data. The Egg App for iOS and Android allows users to instantly share photos, videos and other media, control the connectivity functions of The Egg, access The Egg from anywhere in the world, or even chat to other Egg App users. The Egg is available from the Eggcyte website and is priced at $199 USD for the 64GB model, $299 for the 128GB model and $399 for the 256GB model. Eggcyte offer a returns policy for defective units within 14 days of product purchase. Egg storage devices ship with The Egg, a usb cable and an AC adaptor/charger. Overall, The Egg is a great solution for working professionals that require secure, autonomous data backup that can’t be compromised by cloud service hackers, or for anybody looking for an easy, accessible way to backup and share their content. Previous articleQalo Review – Convenient Durable Silicone Wedding Rings? Next articleTurbo Scrub Review – Powerful Carpet Washer & Cleaner?